New Delhi: Companies are happy to sign on sportsmen and sportswomen as their brand ambassadors, but when it comes to spending on training and building infrastructure for Olympic and rural sports, few are willing to come on board. In fiscal year 2017 (FY17), of the actual spend of Rs6,810 crore on corporate social responsibility (CSR) activities by the top 100 National Stock Exchange-listed companies by market capitalization (data for 92 firms was considered), as analysed by Goodera, a CSR and sustainability management platform, only Rs122.71 crore was allocated to sports. CSR Rules, which came into effect on 1 April 2014, state that companies with a net worth of Rs500 crore or revenue of Rs1,000 crore or net profit of Rs5 crore should spend 2% of their average profit in the last three years on social development-related activities such as sports, education, healthcare and poverty alleviation, among others, which are listed in Schedule VII of the Rules. It appears that the 2020 Olympics Games have not really encouraged companies to devote money to sports in this fiscal year either. “While sports has been included in the list of acceptable CSR spends, not many companies consider it while choosing their CSR projects. Companies usually want to invest in areas such as education or women’s health, etc. Sports is not so high on the priority list," says Viren Rasquinha, chief executive officer of Olympic Gold Quest (OGQ), a not-for-profit foundation that supports the training and preparation of some the country’s top athletes. According to Maneesh Bahuguna, CEO of Anglian Medal Hunt Co. (AMHC), a Delhi-based sports management firm, private sector companies are lagging behind when it comes to putting CSR money in sports in any case. Many public sector companies have been investing in athletes and sports even before the CSR Rules came into existence and they continue to do so. “A lot of companies feel that while opening one school can educate at least 200-300 children, training one athlete only has a limited impact. They need to realize that the ripple effect of one athlete performing well can indirectly impact lakhs of others," he added. Tata Steel Ltd, one of the top 10 CSR spenders in FY17, has put around Rs5.99 crore into promoting rural and Olympic sports. “Our aim is to improve the quality of life in the communities we work with. Sports is a great way to do this," said Biren Ramesh Bhuta, chief CSR officer at Tata Steel. The group has three sporting academies—Tata Football Academy, Tata Archery Academy and the Tata Athletics Academy—apart from a multi-disciplinary and well-equipped JRD Tata Sports Complex, and several sport feeder centres at different locations. “We look to invest in those sports which are relevant to communities where we function; hence archery and now even hockey is a focus for us. We have a hockey academy, the Naval Tata Hockey Academy for young tribal boys, coming up in Jharkhand in association with Dutch partners," said Bhuta. Reliance Industries Ltd has reported spending Rs26.8 crore on development of sports in FY17. “Our focus is mainly on Olympic sports such as basketball and football. In the upcoming years, new sports disciplines would be introduced to widen the scope," says Jagannatha Kumar, CEO of Reliance Foundation. Both AMHC and OGQ accept CSR funds from companies to train athletes. For example, a majority of OGQ’s funds go to a pool from where it chooses how they should be distributed. Most of the donors—almost 90% of them—are repeat supporters of athletes for at least four years (or one Olympic cycle). “Has there been renewed interest after the London and Rio Olympics? I don’t think so. On a medal count basis, we did not perform that well—a total of eight medals from two Olympics. We still find it hard to raise funds. Most of the funding from private companies is because of the individual passion of the owner, and not because of the CSR committee," said Rasquinha. The inclusion of construction, renovation and maintenance of stadiums, gymnasiums and rehabilitation centres among CSR activities means more companies can now spend on sports infrastructure. For example, diversified engineering products group Setco’s CSR funds were used to build the Arena, a multipurpose, multisport stadium in Ahmedabad, while Hindustan Zinc Ltd is setting up a state-of-the-art National Residential Football Academy in Zawar, a tribal belt of Udaipur district in Rajasthan. “The company believes that India has a huge talent that is hidden in rural areas. We are now building an international level football academy in Zawar, which is a tribal area, to bring forward such hidden talent, give them proper infrastructure, training and all facilities. All this support is part of our CSR activities and budget will never be a constraint," said Sunil Duggal, CEO of Hindustan Zinc. The company has already started talent scouting camps and around 40 footballers have been identified for mentoring and training by experienced coaches. The programme will also focus on providing health and fitness facilities, and a nutritious diet to the trainees. 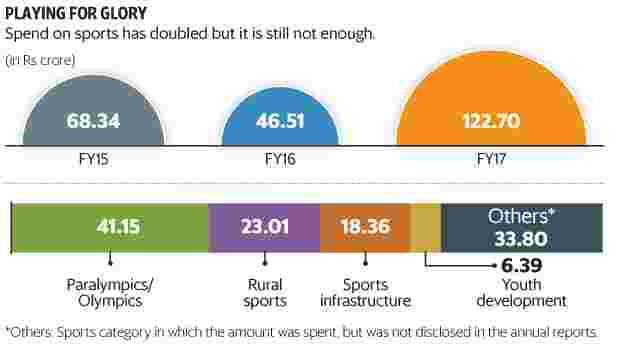 Overall spending by the company in current year on the sport initiatives would be around Rs15 crore. The intent to promote sport is there or is at least increasing. So is the money. However, what the discipline needs now are dependable sports management skills. “Just constructing a stadium will not be enough, you have to run it and manage it. We need more people with knowledge of the structure and execution. That will happen with time as I can slowly see sports becoming a national agenda," said Nandan Kamath, a sports lawyer and co-founder of GoSports Foundation, a non-profit venture. Seema Chowdhry contributed to this story.